Red for Ed leaders say they'll go back to school once Governor Doug Ducey's budget proposal is passed. As of Wednesday night, that has not happened, therefore many teachers have once again called out for Thursday. On April 19, teachers voted in favor of a walkout in an effort to get Ducey to meet their salary and funding demands. 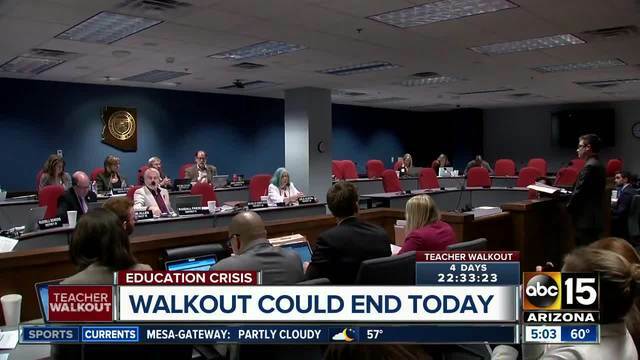 The vote approved a plan to walk out beginning Thursday, April 26 -- and the walkout is still underway. Most schools had hoped to reopen Thursday, but have since said they will be closed because of a lack of staffing. Many Red for Ed leaders, and teachers, criticized the Republican-led funding plan but said it was time to go back to work. "They are still not doing enough, that's for sure," Arizona Educators United leader Noah Karvelis said. "But we need them to do this much now, and we'll be ready to go back by Thursday." Hearings began Tuesday on a state budget proposal that will help fund 10 percent raises for educators next year, and make the first payment toward restoring nearly $400 million slashed from school building and maintenance budgets following the Great Recession. The teacher raise is half a 20 percent bump that Ducey has promised by 2020. "If you can invest, increase spending by a billion dollars, that's what we are doing in this plan, that's a huge accomplishment," State House Speaker J.D. Mesnard, R-Chandler, said. The $10.4 billion budget boosts spending for the 2019 fiscal year beginning July 1 by about $200 million from the governor's January proposal. GOP leaders say the added cash mainly comes from increasing revenue due to an improving economy. The Legislature has slashed about $371 million in annual payments for other school district costs since 2009, including cutting $117 million in Ducey's first year in office in 2015. The money helps schools pay for things like repairs, textbooks, school buses and support staff salaries. Teachers say those and other cuts have made their jobs untenable. The budget restores $100 million as part of a plan to return the payments to pre-recession levels in five years. "The Arizona Education Association cannot support this education budget because it leaves students behind, fails to adequately and sustainably fund public education, and falls short of providing the schools Arizona students deserve. "While this bill moves the needle, it still does not go far enough. It does not restore the more than $1 billion taken from our students and it leaves out school support staff like counselors, bus drivers, librarians, and many more who are vital to the success of our students. The truth is that this budget is far from perfect. Lawmakers brokered it behind closed doors as a partisan deal, without input from us. We were not able to change the minds of lawmakers, so the next step will be to change the faces of our lawmakers. "Make no mistake. Educators achieved something historic and we should take pride in what we have accomplished and in the movement that we have created.